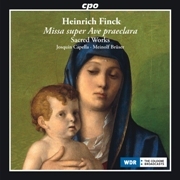 Heinrich Finck was born in Bamberg and quite probably spent his formative years at the court chapel in Cracow or Warsaw in Poland. In any case, this is what can be gathered from comments by his grandnephew Hermann Finck in his Practica Musica of 1556. Here we also read that his granduncle was famed as a master already in the 1480s. After a short period of study in Leipzig he then was active as the church music director at the Polish court in Cracow for a number of years. He interrupted his activity there in 1490 in order to accept a position at the Hungarian royal court, but this arrangement was not permanent. Our first reference to him in Stuttgart dates from 1509. He was probably attracted to the local court by the generous patronage of Duke Ulrich von Württemberg, who paid him an extraordinarily high annual salary to serve as his chapel master. When the ducal ensemble was disbanded in 1514, Finck probably became a member of the imperial court chapel. He later served the Salzburg Cathedral chapter, then at the Scottish Abbey in Vienna, where he contributed to the development of the choral and instrumental ensemble, and finally as the chapel master of Emperor Ferdinand I’s court ensemble. The focus of our new recording is formed by the Missa super Ave praeclara, a mass on the Marian sequence for the Assumption of the Virgin. The other program selections include a longer Passion Office and the motet cycle O Domine Jesu. A Magnificat, a Pentecost motet, and two secular songs round off the impressive portrait of this composer.